To anyone who ever came to my campus, building, or district to train me in something, I apologize. I was probably a jerk. In my defense, I didn't realize it. But things look very different when you're standing in front of a room full of teachers than it does when you're sitting at a table in the midst of them. When everything flips and there's only one of you facing a bunch of them, you realize how overwhelming the little things can become. So as my public penance for what I realize now was exceptionally rude behavior, I offer these five apologies. I apologize for constantly checking my phone during your presentation. I thought I could multi-task. And maybe I could. But in reality, I was engaged in behavior that I would never have accepted from my students. I let myself be distracted by the constant stream of information from "out there" and ignored what was happening right in front of me. You were nice enough to pretend you didn't notice, but I know you did. And it probably made you roll your eyes (on the inside, of course) and wonder if anything you were trying to teach was sinking in. I apologize for never looking up from my computer. Even if it was a technology training, you're human too. I could have encouraged you, nodded my head, maybe even smiled a bit. It would have let you know that what you were saying wasn't just bouncing off the top of my head. But I didn't. I just stared at my screen like a comatose zombie and never looked up. My mother would have been disappointed in me and my complete lack of manners. I apologize for carrying on "quiet" side conversations. I really thought I wasn't disturbing anyone. After all, I only made the occasional small comment to the people I was sitting with. Only it wasn't small. It was disruptive, especially when it co-mingled with the other "quiet" side conversations of my colleagues. From where you were standing, it quickly became a swelling tidal wave of noise that you had to almost shout over in order to be heard. I apologize for interrupting your presentation with a question that could have waited. My impulsivity got the best of me. I could have jotted my question down or made a note to myself. But for some reason, I felt the need to make you stop your train of thought, sometimes even mid-sentence, to answer. Sometimes what I asked wasn't even directly related to what you were talking about at that moment. You were very gracious and took the time to answer, but what I did was more an act of narcissism than of knowledge. My bad, it won't happen again. I apologize for refusing to do anything I was even mildly uncomfortable with. I'm not a big risk-taker, especially if I think I might look stupid. I'm working on that now. But at the time you were presenting, I wasn't in the mood to try something new. I wouldn't get up when you asked. I excused myself from the room. I even pretended I had an urgent phone call. But by doing that, I missed a chance to learn something new, explore a novel idea, or just remember what it feels like to be a student. I should have taken that opportunity. But I didn't, and I'm poorer for it. So to anyone who has ever tried to teach me something, I realize how unbecoming the way I acted was. I'm not saying that I'm going to be perfect from here on out, but I'm going to start doing the grown-up thing and think about my behavior from a viewpoint other than my own. It's the professional thing to do. 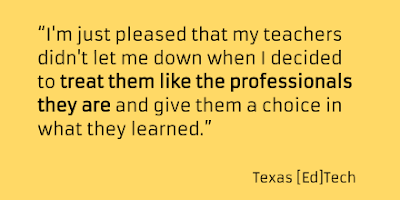 How do you get 19 teachers up to speed on the digital tools they will need in their new 1:1 classrooms? You have an Institute! The brave educators in our district who are piloting GAFE and Chromebooks recently spent 4 days together adding to their toolbox and hammering out what 1:1 will look like at their grade level and in their content area. This was my first time working with a team to plan any sort of extended professional development. We got some things right from the beginning, made extensive adjustments in the middle, and have many notes that we'll improve on for next year. 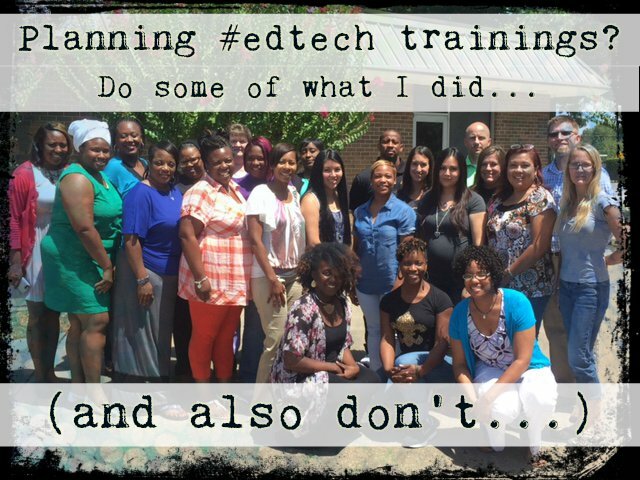 Everything worked out well in the end, and here are 12 reflections from how we ran our Institute that you can learn from as you plan your own PD. Our teachers had never used Chromebooks before and very few had used GAFE. So what were they apprehensive about? Chromebooks and GAFE. What did we start with? Vision, inspiration, discussion, expectations, ISTE standards, 21st century teaching and learning...anything but what they really wanted to hear about. Those other things are completely necessary, but I think everyone would have been much more attentive to the more philosophical aspects of the pilot if we had started with a concrete introduction to the basics. When teachers have questions like "When will I actually get my devices?" and "How will my students turn in their work on this thing?" floating around in their heads, it's really hard to focus on the intangibles. So next time, we will start with a brief overview of our district's vision for 1:1, a quick conversation about how coaches and teachers will work together, and then we will dive straight into what teachers really want to know about: the tools. Train with the tools teachers will use. We did this well. We used Google Classroom to distribute assignments and ideas during the training, collaborated in Docs, and created Slides presentations to share out lesson plans and ideas. By the end, teachers were planning how they could set up collaborative folders in Drive and talking about using Hangouts for ongoing PD throughout the year. Not only did this method give the participants more comfort with the tools, it let them see 1:1 from a student perspective. This helped them identify speed bumps their students might face and got them planning for how they would address them before they ever came up. Early on in the first day, one teacher who was apprehensive about the program put up her hands and said "Just tell me what you want me to do!" She wasn't being confrontational, she was being honest. She wanted to know exactly what "extra" responsibilities this was going to involve. We have long-term goals for the pilot, but we hadn't turned those into any meaningful short-term benchmarks. So I spent the evening of day 2 talking to a friend of mine who's in a similar position, and his solution for his team was to develop goals for every six weeks, stated in terms of what both teachers and students will be expected to do. With his permission, I stole his structure, and on our final day we walked our teachers through exactly how many digital citizenship lessons (which we were providing) they needed to teach, the minimum number of assignments students needed to submit through Google Classroom every six weeks, and the precise strategies we would use to work on research and information fluency. It was definitely a win when that same teacher smiled, thanked us, and said "That's all I've been asking for." Develop a mutual coach-teacher agreement. In groups, teachers and coaches read two excellent articles on what a coach-teacher relationship looks like and what good coaches do. We then recorded our own takeaways from the articles, and in groups came up with our top 3 requirements for how coaches and teachers should work together during the pilot. Voice, choice, control, partnership and confidentiality were recurring themes, and the discussions we had about those areas helped us develop a framework for each person's role in the pilot. As a coach, I needed to hear what was important to my teachers so I could support them in the way they need, not the way I think they need. These hang in my office now. It could have been 3 days. We took 4 days, with each day going from 8:00-4:00, but looking back at our pacing and structure, we could have done the same work in 3 days from 8:30-3:30. A one day difference may not seem like a huge deal, but when you're a teacher who is coming in on your summer break, the difference is massive. Team-building is NOT a waste of time. I'm intensely focused on efficiency, tasks and production. This is a useful bent in a lot of situations, but it can get in the way of developing relationships. Each day, my much more relationally-oriented partner in blended learning led the team in activities that built camaraderie as well as gave them some usable ideas for their classrooms. Since these teachers are the only ones in the entire district who are in this pilot, they need to get to know the other people who are going to be facing the same challenges as them. So even though I tend to jump right into the learning when I lead a training, I see the value in taking a time to let teachers connect over a safe, shared task. We're all creatures of habit, gravitating toward the people we know and staking our claim to a seat like we do with the pews at church. In response to this aspect of human nature, we used protocols like Clock Buddies to mix teachers up and get them sharing. This worked great and let them connect across campuses and grade levels to share ideas and get feedback on their lessons. 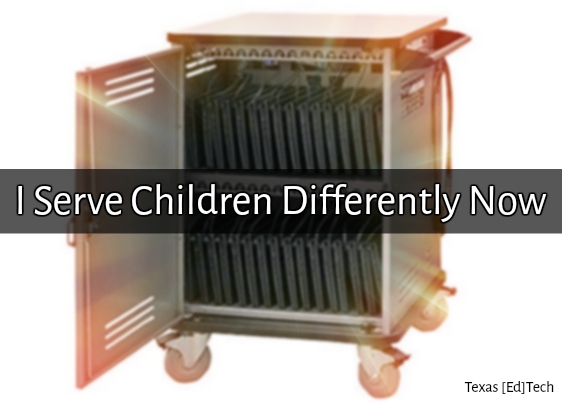 Teachers need "sandbox time" with new tools. We preach discovery learning, inquiry and constructivist philosophy with regard to our students, and I've come to discover that the needs of teachers are no different. Once a tool is presented and they have the basic idea of how it functions, they need time to explore and play (hence, "sandbox time") to really understand how it could fit in their classroom. Don't cut that time short, it's the most important thing there is. Planning time needs clear deliverables. On day 2, we gave teachers about 2 hours of planning time in the afternoon to work with some of the GAFE tools they had learned that day. It was a good idea, but it wasn't structured enough with a clear objective, so teachers weren't able to focus their efforts toward a specific product. So on day 3, we only took an hour for planning and called it "TEKS, Tool, Activity" (if you're not a Texan, the TEKS are our state standards). Teachers chose one standard, one digital tool, and created one activity they could use in their classroom. Then they contributed to a collaborative Slides presentation and shared their activity in triads at the end, receiving feedback from other group members. Knowing that there was a deliverable involved brought a sense of urgency and focus to the planning time, and the clear objective helped them not to feel overwhelmed. They accomplished more in one hour than they had in two the previous day. The final day they took that activity and turned it into a complete lesson, with both traditional and technological elements. This chunking and scaffolding was much more effective and our teachers came up with same fantastic ideas for their students. Listen to the content of the chaos. When teachers get loud, they're either bored or engaged. Confusing. What I learned this week was to listen for the content of the chaos going on around me. If I'm conducting a training and teachers are so excited about something that they're having an in-depth conversation at their table about it, who am I to pull them out of it? That's when I need to take a step back and let them share. But if the conversation is off-topic, then I need to reconsider if my presentation is really relevant to their needs. Those situations are a good time to check in, take a break for a few minutes, or poll the group on how they're feeling about what we're working on. That can be wounding to my pride, but in the long run it creates a much more effective training. We didn't, and we should have. As we were debriefing at the end, one teacher said that she really wished that there had been lunch simply so they could all keep working. What?!? They were disappointed that they had to leave to get lunch and break the flow of what they were doing...man, I really love working with teachers. I don't think you get that kind of attitude in many other professions. So in this case, it wasn't as much about the food as it was about the networking, something teachers in this traditionally isolated profession don't typically get time to do. "If you can't fail, it doesn't count." This pilot is a huge undertaking, the first of its kind in our district. It has the potential, like any project, to fail, which I realized that at the Institute as our vision collided with reality. But at the same time, I was reminded of the title of this book by Dave Guymon. The only way to do something great is to take a risk. We have incredible teachers who are buying in to the vision and are willing to change the way they teach for the sake of our students. We have committed coaches in place to be with them every step of the way, and incredible district administrators who believe this is the right thing to do for our kids. So sure, while it could fail, it could also be an incredible success (and of course, I think it will be). Adjusting and adapting mid-stream is part of any project that breaks new ground, and this Institute was a small snapshot of what this entire year will be like: plan, adjust, change, revamp, implement, evaluate, celebrate and reflect. I'm grateful to the teachers who let us experiment on them, and hopefully you can learn from these reflections on what ended up being a very rewarding, very productive week of training. Why I'm not becoming a Google Certified Trainer. Yet. I recently spent 3 days surrounded by 30 very nice ed-techie Texans, all of whom were focused on the same goal: passing 5 tests to earn the Google Trainer Essentials Certificate. 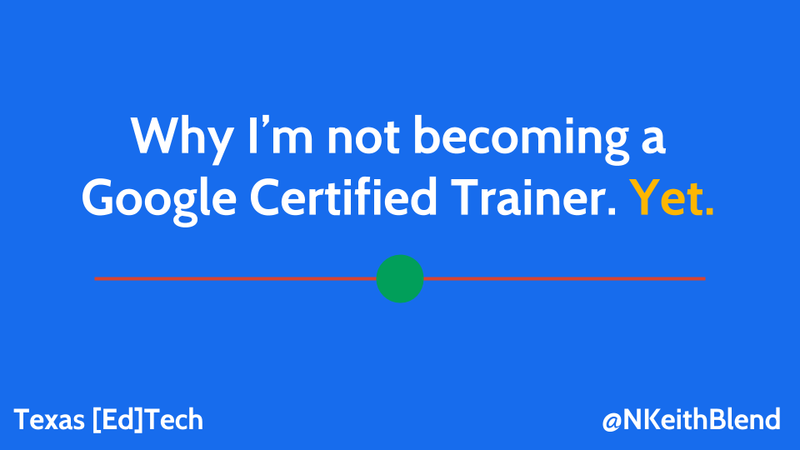 If you had asked me at the beginning of the week what my end game was, my answer would have been "becoming a Google Certified Trainer." But now, I'm not so sure. Just to be clear, you'd be hard pressed to find a bigger evangelist of Google Apps for Education than me. It streamlines teacher workflow, enhances collaboration, and gives student a safe, creative place to explore what it means to be a digital citizen. Marry it with a Chromebook and it takes less time to power up than it does to turn to page 128 in a social studies textbook. It's a game-changer. But the more I think about it, the less convinced I am that becoming a GCT is the path I need to be on right now. The first step was passing the 4 core tests (Docs/Drive, Sites, Gmail, Calendar) and 1 elective (in my case, Chrome), which proved to me that I know what I'm talking about (and I got a fancy certificate to show people when I corner them at dinner parties). Step 2 to becoming a fully certified trainer would only require a resume, 3 references and a screencast, none of which are difficult things to do. But here's my hangup: annual recertification requires conducting 12 Google trainings every year. Practically speaking, that would probably happen without even trying. My job is to train teachers, we're piloting Chromebooks, and we're rolling out GAFE. Opportunities abound. The issue is more philosophical: would I be exclusively focused on the needs of my teachers when one of my considerations in planning professional development is making sure I get my GCT hours in? 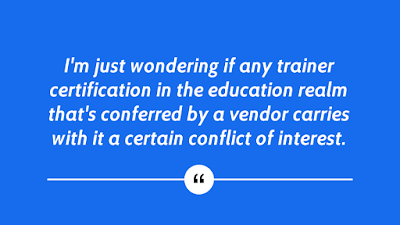 I'm just wondering if any trainer certification in the education realm that's conferred by a vendor carries with it a certain conflict of interest. 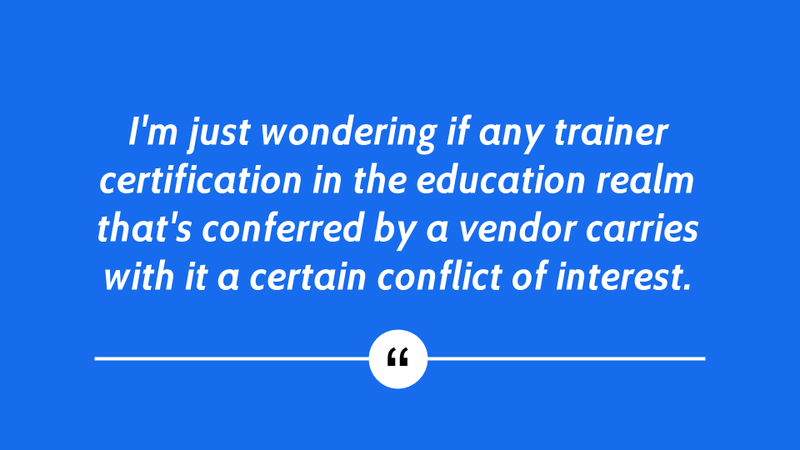 It seems to especially be the case when the recertification process requires prioritizing the vendor's product. While a Google app may often be the best tool for a given situation, equally as often it won't be. I want to make sure I keep the freedom to train teachers using whatever works best, which means evaluating a variety of tools from diverse sources, then picking the one that meets the need without stopping to consider if it meets my recertification requirement. So for my first year, I'm going to make sure I'm focused on who I'm serving, not on reaching a training number. Maybe once I get some experience under my belt, I'll realize that there are plenty of hours to go around. We'll see. 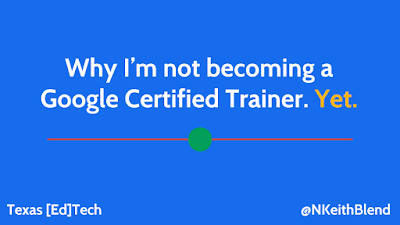 But for now, that's why I'm not becoming a Google Certified Trainer...yet.